Treat yourself to a fresh stock of applicator pads! This kit contains an assortment of our most popular applicator pads. You'll be sure to have the right applicator pad for any detailing job. These applicators are made of a unique foam composition that conforms to the curve of your tires’ sidewalls. Foam applicators that are precut into a curve might not match the curvature of your vehicle’s particular tires. Cobra Flex Foam Tire Dressing Applicators flex to hug the rubber and apply a neat, even layer of tire dressing. These applicators also work well on interior and exterior trim, rubber, plastic, and vinyl. Flex Foam Finger Pockets are made of ultra soft foam that wipes on wheel wax and works in fine polishes on wheels. Our Flex Foam Finger Pockets are made of ultra soft foam that wipes on wheel wax and works in fine polishes on wheels. The Flex Foam Finger Pockets fit over 3-4 fingers and make it easy to apply products to tight spaces. Apply polish around emblems, trim, and underneath door handles and spoilers. When you need to get into the small areas of your wheel, these Flex Foam Finger Pockets are perfect! These universal applicators are made of quality closed cell soft poly-foam. They are pliable, strong, and efficient. Use again and again, for any applicator need, then simply toss in the washing machine and they are good as new. The outer surface of the Microfiber Applicator Pad has all the qualities you’ve come to expect from the finest in microfiber technology. The gentle, yet strong fabric is wrapped snuggly around a plush, absorbent sponge. This innovative combination of materials causes wax, polish, dressings, and sealants to spread more evenly, resulting in maximum coverage while using less emulsion. The open-cell construction grabs at foreign matter on your car and pulls it safely away. 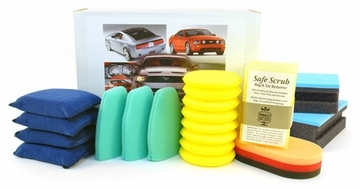 The Safe Scrub Bug & Tar Remover Pad can be used on glass, chrome, vinyl, fiberglass, paint and clearcoats—100% safe when used with soapy water. The honeycomb texture separates sticky contaminants from the vehicle surface without scratching. Rinse and reuse the Safe Scrub Pad countless times! This kit contains 19 applicators! You won’t find a better value anywhere! A total retail value of $67.34. A savings of $27.35!